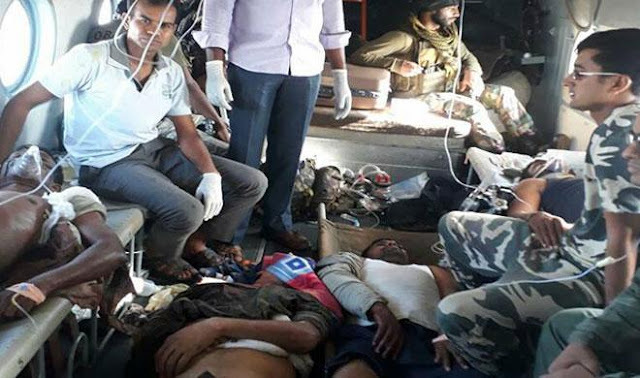 New Delhi: 25 CRPF personnel have died in an encounter with the Maoists in Sukma area of ​​Chhattisgarh. At the same time, the condition of 6 jawans is being reported to be serious. The injured jawans have been admitted to Ramkrishna Hospital in Raipur. The central government has been very active since the attack. Yesterday, Union Home Minister Hansraj Ahir will visit Chhattisgarh. Seven youth, including CRPF Company Commoder, are missing as per the missing information after the attack. Since then, it is feared that the Maoists have not kidnapped the jawans. Read also - IIPL 2017: The most expensive "Ben Stokes" has thrown up win against the most "big" team in Pune # IPL10Prime Minister Modi tweetedPrime Minister Modi also tweeted on the Sukma attack. 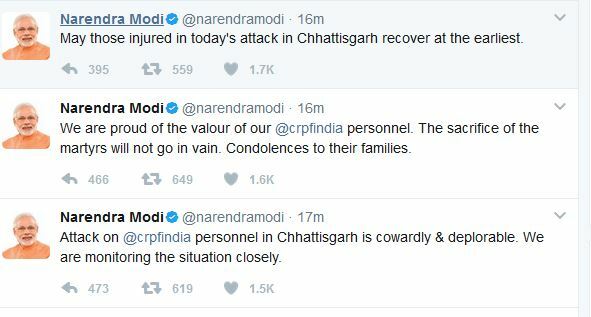 The Prime Minister wrote, "The attack on CRPF jawans in Chhattisgarh is cowardly and regrettable. We are reviewing the situation. We are proud of our soldiers, the sentiments of the martyrs' family. " 0 Response to "Big news: 25 soldiers of CRPF martyrs in Sukma Naxalite attack, PM-Shahadat speaks not worthless ..."